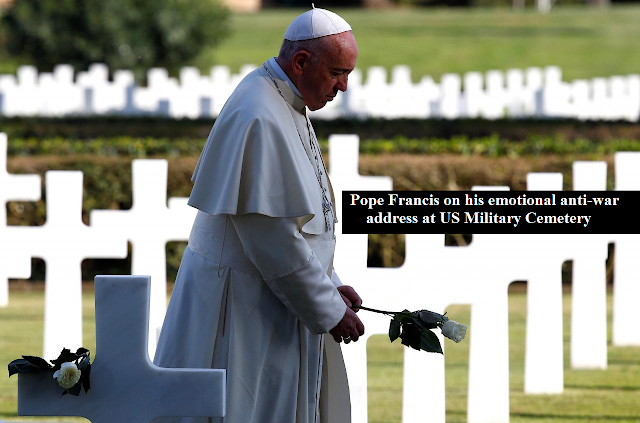 LOOK: Pope Francis sa kanyang “emotional anti-war address” sa US Military Cemetery! Read: Pope Francis, hopes married men become priests. On Thursday, Pope Francis made one of his most emotional anti-war addresses during his visit to the US military cemetery that the world seemed to be headed into war perhaps bigger than any before. The cemetery Mass was attended by US Ambassador to Italy Lewis Eisenberg and the acting US ambassador to the Vatican, Louis Bono. Francis said a Mass for several thousand people at the Sicily-Rome American Cemetery in the town of Nettuno, south of the Italian capital, on the day Roman Catholics commemorate their dead. "Please Lord, stop. No more wars. No more of these useless massacres," he said, speaking in hushed tones in an improvised homily. "If today is a day of hope, it is also a day of tears," the pope said. "Humanity must not forget" the tears of mothers and wives who lost husbands and sons in past wars. "Humanity has not learned the lesson and seems that it does not want to learn it," he said, asking for prayers for the victims of today's conflicts, especially children. He added. Moreover, on his way back to the Vatican, Francis stopped to pray at the Ardeatine Caves, where in March, 1944 occupying Nazis killed 335 Italian men and boys as a reprisal for the killing of 33 German policemen by partisans.